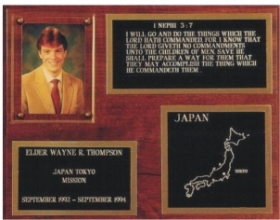 ***If you would like Elder or Sister added to the name plate, please type Elder or Sister as part of the name. Please limit scripture to ten lines. Thanks. If you do not receive confirmation or receive the plaque within 5-7 business days please give us a call to make sure we received the order. Thanks. Note: Shipping to Canada, expect to pay Tariff/Duty when plaque is delivered.